When we speak of catalogue pools and signature pools, we are generally referring to mirror pools. Mirror pools are the most beautiful and efficient pools on the market and are very popular with domestic users and designers. They are guaranteed to blend into their house and garden surroundings. With 15 years' experience of swimming pools, Yann Aquilina and Matthieu Bouvier designed and developed ISI-MIROIR in order to make dream pools affordable for both domestic and professional use. 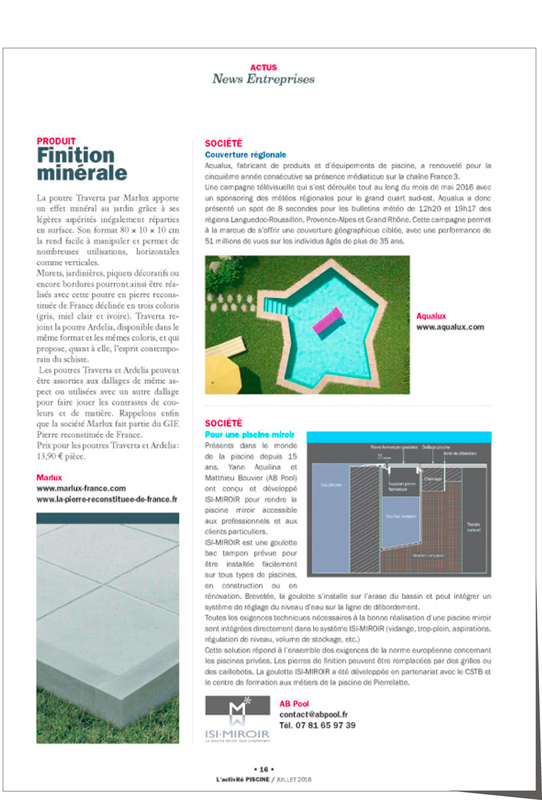 Based on an analysis of the needs of swimming pool professionals, ISI-MIROIR is a real innovation in the world of mirror pools. It consists of a channel levelling system designed for easy installation on all types of pools, whether new or old. The channel is patented for Europe, is attached to the levelling course and can include a system for regulating the water level at the overflow line. The channel is sized to be able to contain enough water to act as a levelling tank. So you no longer need to build an additional levelling tank. ISI-MIROIR comprises all the technical requirements for the successful installation of a mirror pool (drainage, overflow, suction, level regulation, storage volume etc.). The channel is masked with a covering stone that can be removed at any time. The channel thus remains completely accessible while leaving a gap to allow water to flow from the pool to the channel. This particularly elegant solution satisfies all the requirements of European standards for private pools. The covering stones can be replaced by grating or duckboards. The water barrier of the channel uses a reinforced membrane and is independent of the structure of the channel. The pool levelling course can simply be covered with the pool's water barrier system or with a 1 or 2 cm thick covering stone. A system for regulating the level of the covering stone or grating on the channel means that it can be adjusted to the height of the levelling course.